A: The thumbnail in a page turning book is a catalog to show the miniature pages of book, aimed at letting reader to preview the following content of book. Through thumbnail, readers can get probably understanding for the book and quickly locate the page that attract them. Therefore for convenience sometimes you might want to set thumbnail initially shown when flash flipbook is opened. If you are going to facilitate your readers by setting the thumbnail auto shown when launched. Let’s go ahead to learn how to realize this from the below tutorial. 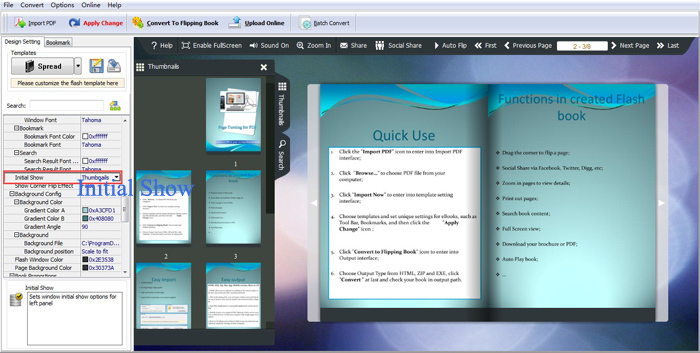 Step 1 : Launch your Page Turning Maker software and import targeted document for conversion. Step 2 : Turn to Design Setting dialog, and search for the option “Initial Show”, then select thumbnail from the drop-down box. Step 3 : Choose “Apply Change” button to verify previous settings.